Bet the Raiders +3.5 over the Dolphins with SugarHouse. Bet the Raiders-Dolphins under 44 with SugarHouse. Parlay the Raiders to win the first half & the first-half over 21.5 at +325 with SugarHouse. The Raiders desperately need a win. 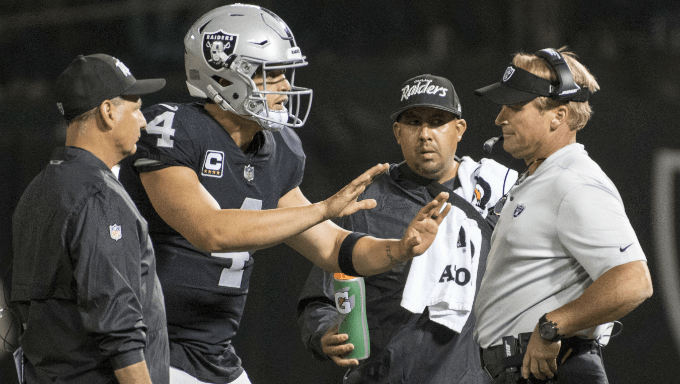 They are 0-2 in Jon Gruden 2.0 despite all the excitement that met his return in January. There are big questions about Chucky these days. His team is winless, which has been highlighted by his inability to make second-half coaching adjustments and a lack of a pass-rush. Couple those issues with his head-scratching trade of uber superstar defensive end Khalil Mack to the Chicago Bears on September 1 and folks are questioning Gruden, who coached the Raiders from 1998-2001 and then was traded to Tampa Bay, where he beat Oakland in the Super Bowl 15 years ago. Oakland played better than Week 2 loss at Denver than it did in the season opening loss to the Los Angeles Rams on Monday Night Football. But Oakland is still looking like a lacking team. Plus, this team hasn’t won since Week 13 of last year when they beat the dreadful New York Giants at home. The Raiders are dying for a victory. The Miami Dolphins are one of the surprise teams of the early going of the NFL season. They are one of seven undefeated teams. The 2-0 Dolphins are atop the AFC East Division by themselves. This team was not expected to vie for a playoff berth. But Miami has been the better teams against both the Tennessee Titans and the New York Jets. Quarterback Ryan Tannehill has run the offense well. Defensively, Miami has been timely. Perhaps the Dolphins have enough to make a long run. The Raiders didn’t get too banged up against Denver. Oakland is pretty healthy. Starters defensive tackle Justin “Jelly” Ellis and PJ Hall are out. But Oakland likes the rotation of rookie Maurice Hurst and new veteran Jonathan Hankins and Clinton McDonald. It's interesting that Miami quarterback Ryan Tannehill is on the injury report with knee and ankle issues. He did practice fully Wednesday, so it may be a precaution. But for a player who is coming off a torn ACL, it is worth noting. SugarHouse has the Dolphins as a 3.5-point favorite. It’s clear the oddsmakers are not sold on Miami. Perhaps it’s because the Dolphins didn’t topple world beaters in the Titans (although Tennessee was a playoff team last season) or the Jets. Perhaps the oddsmakers want to see Miami win some more games before establishing a healthier line in their favor. Perhaps the oddsmakers were impressed by the Raiders in a loss at Denver. Oakland did beat Miami last November in Miami. But there was no Tannehill and the Raiders are a completely different team. I do think this game will be close and I think Oakland can play in Miami. It is supposed to be in the high 80s and muggy in South Florida on Sunday. However, the Raiders are weather-tested. Sunday’s game in Denver was the hottest NFL game ever in the city at 93 degrees at kickoff. The heat coupled with the always tricky altitude of the Mile-High City and it was a brutal outing for the Raiders. So, the discomfort of Miami will not be anything new for Oakland. I would lean toward taking the Raiders and the 3.5 points at SugarHouse. The over/under at 44 points. That seems pretty fair. Both of Oakland’s games have gone under and Miami has not been playing high-scoring games. Miami’s games are averaging 34.5 points a game and Oakland’s games have tallied 46 and 39 points in their two games. Oakland has played well in the first half, leading both games. Plus, Oakland has started well. It has scored touchdowns in three of the four halves it has played. The problem for Oakland is that it has fallen apart in the second half. The Raiders have been outscored, 43-7, in the second half this season. It’s 36-point differential is worst in the league. Because I think they are two similar teams and because I’m not sure Oakland’s offense is ready to explosive, I would lean on the side of the under at SugarHouse , although it might be barely. We like Oakland in this parlay. As we said, Oakland has started fast. It has scored opening drive points in both games. They have led in both games. Gruden has this team pumped and believing in itself as it starts games. This would be a good bet at +325 at SugarHouse .